One of the zoo’s busiest places for little people is Grammy Nell’s, and directly across from that place is one of the zoo’s busiest places for little animals: El Rey de la Montaña. 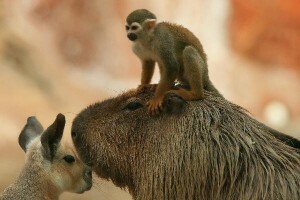 This South American habitat is very diverse, featuring mammals, birds, and reptiles. 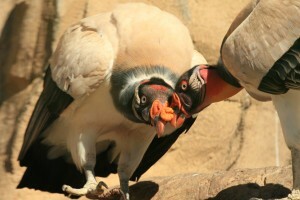 It is named for the King Vulture, who is El Rey de la Montaña, or the “King of the Mountain,” in this exhibit. In addition to this beautifully colored bird of prey, a wide variety of animals keep the visitors entertained as they interact with each other. Squirrel monkeys, capybara, sun conures, and two-toed sloths are just a few of the animals one can watch and learn about at El Rey de la Montaña.